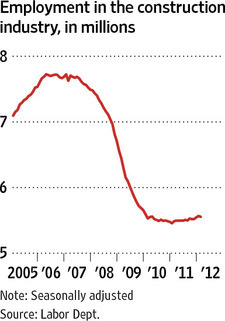 The job recovery in the U.S. may be gathering steam, but the construction sector so far is being left behind. In February, there were 5,554,000 people working in the construction sector on a seasonally adjusted basis, down from 5,456,000 in January, according to the Bureau of Labor Statistics. As of February, the construction sector had added only 98,000 jobs from its postrecession low hit in January 2011. The sector hit its record high in April 2006 with 7,726,000 workers, according to the BLS. Obviously the market outlines the fact that new construction is not making strides when other sectors are seeing growth. One of the obvious factors is that there was an abundance of existing inventory in many markets that needs to be soaked up before we see new construction growth. In speaking with construction and skilled professionals in the San Francisco Bay Area, things have the appearance of a strengthening economy. Many updates and facade improvements are happening now, but new construction appears to be remaining stagnant. What are your thoughts? This entry was posted on March 14, 2012 by pipros in Market Updates, National, Peninsula and tagged Construction, construction project, construction sector, Market review.